iPhone X with 256GB storage is the most popular device among prospective smartphone buyers, according to a survey conducted by RBC Capital Markets. 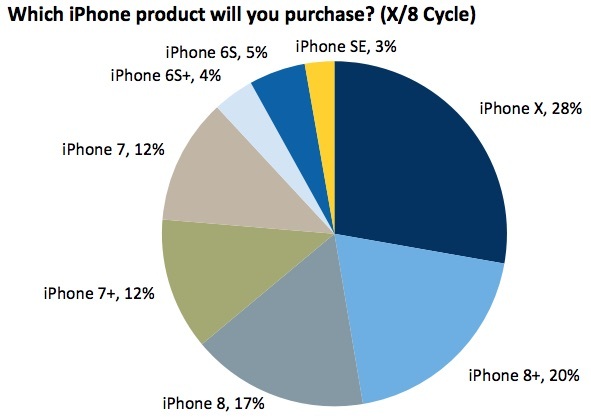 Of the 832 individuals surveyed, 28 percent said they plan to purchase iPhone X as their next smartphone. An additional 20 percent of respondents said they intend to buy iPhone 8 Plus, while 17 percent will go for iPhone 8. The remaining 35 percent of consumers plan to purchase an older model, ranging from iPhone 6s to iPhone 7 Plus. RBC Capital Markets said 43 percent of prospective buyers interested solely in a new iPhone are looking to purchase an iPhone X, while 32 percent favor iPhone 8 Plus, but no accompanying chart was provided for this data. 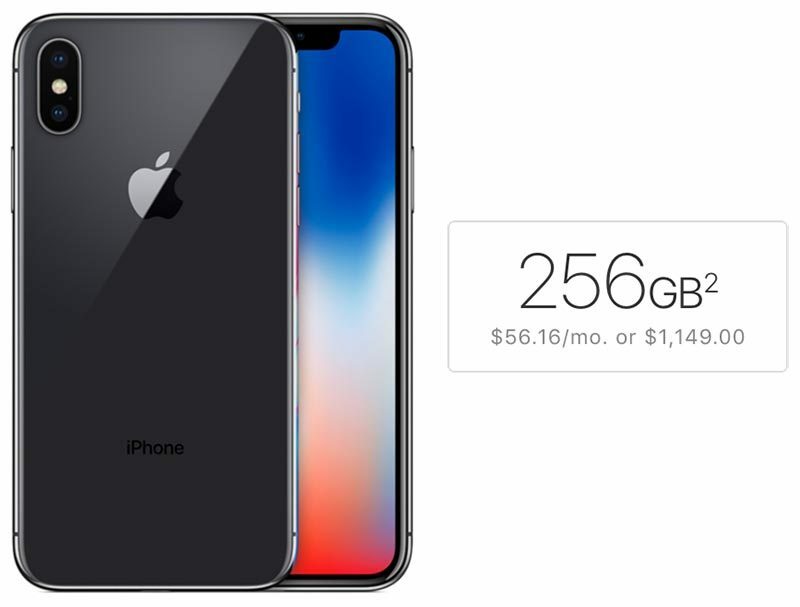 A majority 57 percent of respondents who plan on purchasing iPhone X will opt for the 256GB model, which costs $1,149 in the United States. 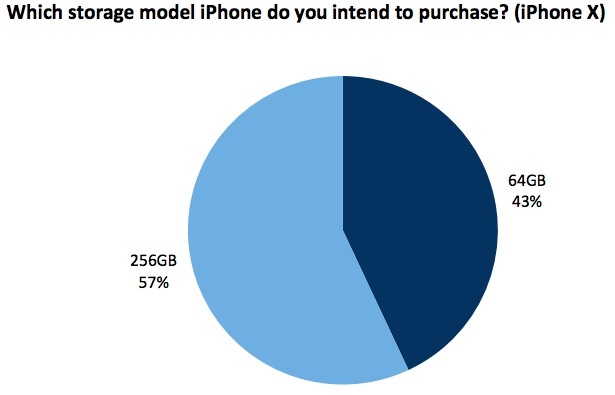 43 percent said they will buy the 64GB model for $999. By comparison, 50 percent of iPhone 7 respondents last year opted for 128GB, which was the middle tier between 32GB and 256GB. Interestingly, Apple has removed the middle-tier storage option from iPhones. We think that given increasingly greater storage requirements, most of mid-tier storage users will move towards the higher tier. 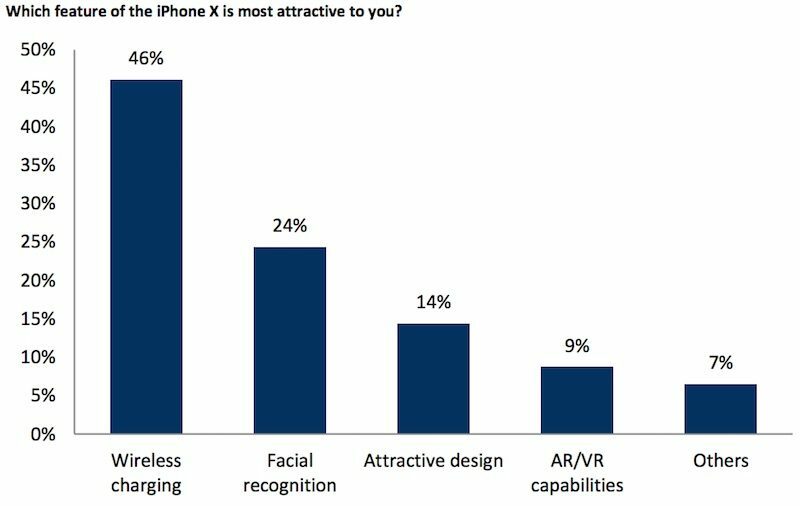 46 percent of a larger pool of 4,196 respondents said wireless charging is iPhone X's most attractive feature. Overall, RBC Capital Markets expects strong demand for iPhone X, which should increase Apple's average selling price for iPhones in general. The investment bank remains upbeat about Apple's stock, with a price target of $180. iPhone X pre-orders start Friday, October 27. The device launches Friday, November 3. Of course...why does the 64GB model even exist on a phone that costs 1K? Have to admit I'm surprised about the breakdown for most appealing feature. Wireless charging to me is sort of meh since you still have to put the phone in a particular/specific spot, which itself is wired to an outlet. Happy to take it, I guess, but not something that's especially bothered me as "a problem" with the phones I've owned for the last 10 years. To me it's the very large screen is a relatively compact body that's most appealing. You would think that the lowest would be 128 for this price point. I think I'll go with the 64. I have the 128 7 plus now and still have plenty of room left. Most of my "stuff" is in iCloud anyway. So much for those who dissed the attraction of wireless charging. 24% of the surveyed are opting for 7/7+. I'm getting two 7's so I'm in that group. Makes sense. People who are paying 1K+ for a phone may as well get the most storage. What do you do with 256GB of storage? My iPhone 6 w/ 64GB is only 65% full and I could cut it down easily if I needed to. I'm genuinely curious as I can't figure out why people need so much storage. Too bad there is no 512GB option like the iPad. More storage is always a good thing. Maybe next year. Should be 128GB and 512GB.